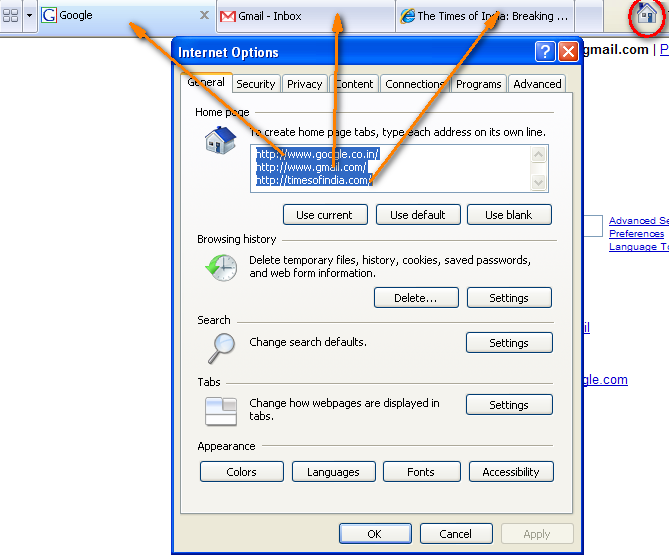 Internet Explorer version 7.0 (IE 7.0) was recently made available for download by Microsoft. Many users have already made the switch from IE 6.0 to the latest version. Many reviews have been written about it, emphasising on the look and feel. There is a very exhaustive review at Computerworld which readers may like to go through, especially those who are yet to move to this version. Most of these reviews have mentioned about the introductions of tabs as coming in quite late. However, there is a killer of a feature in tabs, that makes your web experience much superior to other browsers such as Opera(I like the pink!) and Firefox, which have had tabs implemented for a while. This is the concept of multiple home pages. So when I start IE 7.0 on my machine, it opens not one but three tabs(see the view) and loads three different sites which I have set as the respective homepages. Likewise, when I am browsing with an tab, and I click on the home icon , it opens three more tabs which load the three homepages I just mentioned about. The number could be greater or lesser than three and this is entirely upto you. People who track specific sites multiple sites across the day, would love this feature. So how to go about setting this feature. 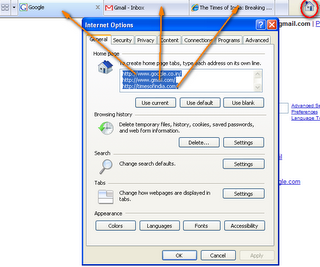 On the right side on Internet Explorer 7.0, you would note Tools tab. Expand this tab and click on Options. In the window that emerges, just decide your favourite home pages and key in the URLs, one per line. Depending on the number of URLs you type, IE 7.0 will make them as your home pages. Cool! The second cool feature I liked was the flexibility to select your own search engine in the newly introduced search box, and it does not have to be MSN/Live. As an Opera user I am happy with IE 7.0, but would have felt happier if they had provided a shortcut to disable and enable proxy server(It is F10 on Opera), which is such a pain every morning as we plug in the laptop in the office, (where we need the proxy) after using it at home(where we do not need proxy). If there is a second thing I would look for, it is the flexibility to close tabs as they are, that is , even without making them active(It will save a click).But overall quite cool. Only IMT bloggers i know of, are you ,Mayank Krishna and Rajeev Karwal. Nothing new to add to who you already know. CRICKET:WHAT, BCCI DOES NOT EVEN HAVE A WEBSITE? !